Here’s a cute and pretty easy Halloween cupcake idea from the Ladies Home Journal website. These are for the Neighborhood Halloween party tomorrow night. 1. Frost cupcakes and set aside. Lightly dust work surface with cornstarch and roll fondant out in a thin layer then cut into 18 1 1/2″ rounds and 18 4″ rounds with cookie cutters or biscuit cutters. Knead scraps together and reroll, as necessary. 2. Insert the stick of an unwrapped lollipop into a block of Styrofoam (or half a potato or apple) to hold it steady (or just hold it in one hand!). Place one 1 1/2″ fondant round over lollipop and pinch to close around pop. Then place larger fondant round over the smaller one, pleating to make a ghost shape. Repeat for all lollipops. 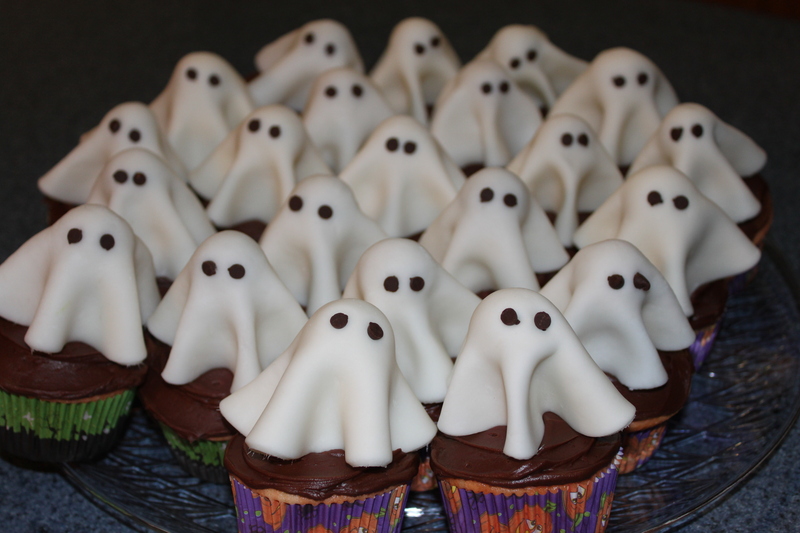 Place a ghost in the center of each cupcake by inserting the stick into the cake. Pipe black eyes on each (or just poke pointy ends of mini chips into the fondant). adorable. And I don’t even like fondant. But these are about too cute to pass up! The great thing about these is, if you don’t like fondant it’s easy to peel off and just eat the cupcake, but this fondant is pretty good, it’s got a bit of a citrus taste to it so you might like it! Pingback: 35 Terrifyingly Tasty Halloween Cupcakes To Charm Up Your Treat.